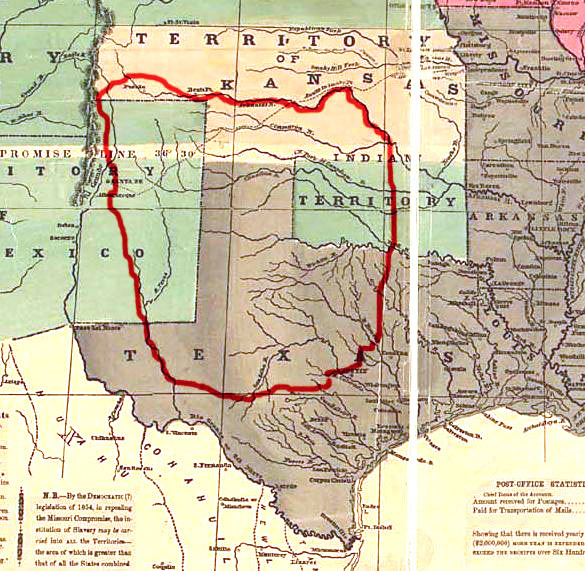 A map of Comanche lands prior to 1850. In the 18th century, the Comanche established a virtual empire called Comancheria over a large portion of the southern Great Plains which they shared with the Wichita, Kiowa, and Kiowa Apache and, after 1840, the southern Cheyenne and Arapaho. Comanche power peaked in the 1840s when they conducted large scale raids hundreds of miles deep into Mexico while also warring against the Anglo-Americans and Hispanics in Texas. Their decline resulted from epidemics of cholera and smallpox and encroachments on their territory by the expanding population of the United States. The Comanche also warred on many neighboring Indian tribes, especially the Lipan and other Apaches. ↑ Kenner, Charles L. A History of New Mexican-Plains Indian Relations Norman: University of Oklahoma Press, 1969, pp. 28, 206-213.